Welcome to the Health and Fitness Experts video series. I’m Francis, and today we’re going to talk about the carbs in vodka. First the good news: there are no carbs in vodka. That’s right, vodka has no carbs. So when you hear about so called low-carb or low-calorie vodka, you’re just being tricked by some smart marketing folks who only want to sell you more vodka. But as usual, that’s not the whole story. Vodka has no carbs, but it definitely has calories. Almost all the calories in vodka come from alcohol. And calories from alcohol are actually much worse for you than calories from carbs. That’s because, while carbs have four calories per gram, alcohol has seven calories per gram. That’s almost as many calories as you’ll find in fat. And just like carbs, your body will burn alcohol before it burns fat. So if you’re trying to lose weight, drinking alcohol will delay your fat burning and slow down your weight loss. To make things worse, many vodka cocktails use mixers that are very high in both carbs and calories. In fact, some of the most popular vodka cocktails use mixers that will almost double the calorie count of your drinks. So while vodka may have no carbs, your vodka cocktails may be full of both carbs and calories. That’s why if you’re trying to lose weight, it’s really important that you watch out for the mixers. You need to count all the calories in your vodka cocktails. That means counting the calories in both the vodka and the mixers. That’s it for this episode. 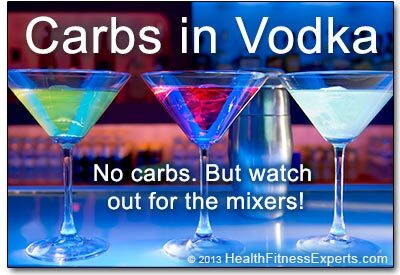 But you can find out a lot more about carbs in vodka on our Health and Fitness Experts website, including information about low-carb and low-calorie vodka cocktails. You’ll also find tons of useful tips on diet, exercise, and nutrition that will help keep you healthy and fit. Thanks for watching, and we’ll see you next time! There are no carbs in vodka. But there are definitely calories. And vodka cocktail mixers usually add a lot of carbs and can almost double the calories! So watch your mixers and count ALL the calories. Watch the video (above) or read the article below for the details. Worried about the carbs in vodka? First the good news: Vodka has zero carbs. But that’s not the whole story. While there are no carbs in vodka, there are calories. And many mixers used in vodka cocktails are full of carbs and calories. And to make things worse, your body burns the alcohol in vodka just like it burns carbs. Let’s take a closer look at vodka carbs, and then we’ll give you some tips about low-carb and low-calorie vodka drinks. Not only are there are zero carbs in vodka, but vodka also doesn’t contain any meaningful amounts of protein or fat. Almost all the calories in vodka come from alcohol. So if you are worried about the calories in vodka, don’t worry about the carbs. Instead, worry about the alcohol content, or proof. The higher the proof, the higher the calorie count. And the only way to get low-calorie vodka is to lower the alcohol content. That’s why Smirnoff low-calorie vodka is only 60 proof (30 percent alcohol) instead of 80 proof (40 percent alcohol) like the regular Smirnoff. They are charging you the same, but giving you 25% less alcohol. You’ll get the same “low-calorie” results by just using 25% less vodka in your drinks! Alcohol in Vodka Has More Calories than Carbs! It might sound like good news that vodka has no carbs. But the truth is that the alcohol in vodka has even more calories than carbs. Alcohol has 7 calories per gram, while carbs have only 4 calories per gram. And just like carbs, your body burns alcohol before it burns fat. So if you are trying to lose weight, alcohol will delay fat burning and slow down your weight loss. That’s why it’s important that you count the calories in your vodka drinks. This is especially important if you drink vodka cocktails. Most people drink vodka combined with mixers in a vodka cocktail like a screwdriver, cosmopolitan, or a vodka tonic. Vodka has no carbs. But the mixers are usually full of carbs AND calories. So watch out! Unfortunately, the mixers used in many vodka cocktails are sugary and full of carbs. These mixers can often double the calories in your vodka drinks. So if want to keep your cocktails low-carb and low-calorie, you really need to watch out for the mixers. To help you out, we’ve included some helpful tips in our related article: Calories in Vodka and How You Can Minimize Them. The news about vodka isn’t all bad. There are actually some real health benefits to drinking vodka — as long as you drink in moderation! The alcohol in vodka can benefit you in many ways, from boosting your cardiovascular health to boosting your brain power. You can find out more in our article on the Health Benefits of Red Wine and Alcohol. Do you have a favorite vodka cocktail? Do you have your own tricks for keeping them low-carb and low-calorie? Share your own tips by giving leaving a comment below. Berkeley, CA: University of California, Berkeley. School of Public Health. University of California, Berkeley.